Launch has been postponed. Now they say 15 august 2010. Stay tuned. The site as of today is not visible to all, but I had a chance to view it and site looks clean and most importantly most of its links are working. The website has been designed in Joomla and looks neat. Sir, Baricade has been putup by the police near the 2nd railway gate,Tilakwadi where 6 roads joins.This has made the traffic flow smooth.Before this ,when the railway gate closes,there was heavy traffic jam,which remains upto 20-30 minitues.Puting up of baricade be somewhat inconvenient to some of the residents/shop keepers nearby.But,it will be more convenient to the public in large ,whose vehicles moving towards Khanapur,Goa, adjoining extension areas etc.The media is there to pickhole whatever good things done by the govt.Don”t heed to it Sir.The general public will adjust to it slowly.” To gain something we have to, loose something”.Please don”t remove the baricade. 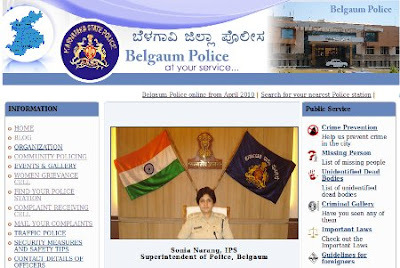 During B J P Administration there was complete website of BELGAUM distict police with all officers name phone no. and email i ds SO THAT PUBLIC CAN APPROACH CONCERNED PERSON. nOW IN THIS GOVT WE DONT HAVE THIS WEBSITE N WHEN ASKED THE REPLY FROM POLICE IS THE WEBSITE IS UNDER CONSTRUCTION OR PREPARING.YESTERDAY I WENT TO APMC POL. STN. THEY SAY THE new PSIs are not yet reported for duty. That 'opening tomorrow' has become a better formatted 'Opening Shortly!!!' now. Wonder if this is the first sign of a glitch. Am not a pessimist in the truest sense, but sadly, I am little skeptical of the level of maintenance that they are capable of with so well marinated commitment towards corruption. if this site works i will be there to complain on police taking bribe. and the illegal activities going on as i know quite a few places. n if this is seen by senior officials it will be great. Great News for us Belgaumites. Hope the site will be vibrant and responsive to Citizen's needs. First step to development. Congratulations. Hope they grow from obsolete to advanced status not only in website development but in serving the city. I agree with you Sunil. I hope this is the beginning of the integration of all the services related to police service (I mean ALL) in a unified way online. Lots of initiatives taken up in huge media spotlight take a back-seat in course of time. I sincerely hope this one does not fall among them. If citizens keep up the pressure of using the services, the authorities will be forced to maintain it!! My only concern here is will this website be updated on a daily basis?